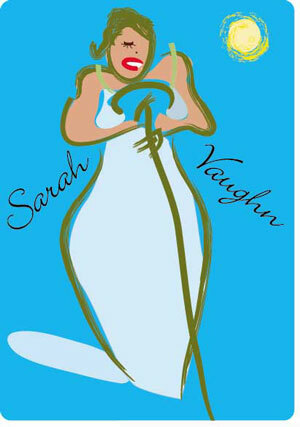 Life of Sarah Vaughn is a special story of a stylish lady who never compromised her style and grace to become one of the most special voices in jazz! The sister was quality all the way! Vaughan dropped out of high school during her junior year to concentrate more fully on music. Around this time, Vaughan and her friends also began venturing across the Hudson River into New York City to hear big bands at Harlem's Ballroom and Apollo Theater. In the Summer of 1949, Vaughan made her first appearance with a symphony orchestra in a benefit for the Philadelphia Orchestra entitled "100 Men and a Girl." Around this time, Chicago disk jockey Dave Garroway coined a second nickname for her, "The Divine One", that would follow her throughout her career. In 1951, she made her first tour of Europe. 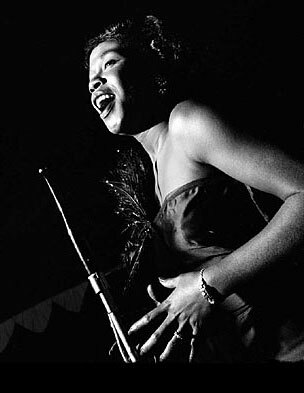 The latter half of the 1950s often found Vaughan in the company of a veritable who's who of jazz as she followed a schedule of almost non-stop touring. She was featured at the first Newport Jazz Festival in the Summer of 1954 and would star in subsequent editions of that festival at Newport and in New York City for the remainder of her life. In the Fall of 1954, she performed at Carnegie Hall with the Count Basie Orchestra on a bill that also included Billie Holiday, Charlie Parker, Lester Young and the Modern Jazz Quartet. Vaughan remained quite active as a performer during the 1980s and began receiving awards recognizing her contribution to American music and status as an important elder stateswoman of Jazz. The lady still had a strong voice even up in age! In the Summer of 1980, Vaughan received a plaque on 52nd Street outside the CBS Building (Black Rock) commemorating the jazz clubs she had once frequented on "Swing Street" and which had long since been demolished and replaced with office buildings.